Donald Trump speaking with supporters at a campaign rally at Fountain Park in Fountain Hills, Arizona. Gage Skidmore/Wikimedia Commons. All rights reserved. As morning unfolded on this side of the Atlantic on November 9, Donald Trump addressed his supporters as the 45th president-elect of the United States. A racist, misogynist and blatantly ignorant candidate will be seating in the Oval Office at 1600 Pennsylvania Avenue. And he will bring along some of the most conspicuous American champions of racism and divisiveness. Mr. Trump is set to draw Americans further apart. Stopping him from doing so requires an exercise in humility. When the values of our liberal democracies cease to be obvious to many, it is our responsibility to remember voters why such values are so important in the first place. We have to remember that, as it has happened in the past, even seemingly all-powerful administrations can be held accountable. This election was supposed to end with Mr. Trump being defeated by the coalition of the diverse and the cementing of Mr. Obama´s legacy. The opposite happened. The white voters’ fear of their status being in danger turned out to be stronger than the women and minorities’ fears of what Mr. Trump stands for. There is no return to normal after this result. Once the elections are over, the political class and society in general have a tendency to normalize what the polls and the electoral system have produced. But Mr. Trump’s lack of respect for the country’s political culture, his ignorance, and his willingness to appoint white supremacists and far-right characters to key posts in his administration is anything but normal. On the contrary, it warns us that America is likely to be governed by its least qualified and more unprincipled citizens- and thus turn into a Kakistocracy. Mr. Trump is, at the same time, a media creation and a media creature. Journalists treated him as a celebrity from day one, and he capitalized on it through social media. From incendiary tweets to press conferences, everything the Republican candidate did made the headlines and front pages of most newspapers. Mr. Trump’s narrative successfully hijacked political debate, replacing political exchange with high-handed attacks and impossible promises. Few seemed to notice that the debate moved from ideas to identities. The point was to get people so confused that they would give up on the debate altogether. Mr. Trump’s narrative successfully hijacked political debate, replacing political exchange with high-handed attacks and impossible promises. Observers and political commentators assured us that the Republican candidate would not win - that Mr. Trump´s candidacy was a power play, a marketing campaign to further his brand. The possibility of such an unexperienced candidate to land the most important job in the world certainly seemed like something of a joke. But they missed the big picture. Many Americans did not trust Mr. Trump, but they did not trust Hillary Clinton either. Her campaign failed to present a clear narrative, close to the average voter’s feelings and interests, and to put forward a captivating message. Both the media and the Democratic Party realized too late that the joke was on them. When they did, the damage had been done. Post-truth politics had won. Now, several politicians – including Hillary Clinton and Barack Obama – are arguing that we should give Mr. Trump a chance. But normalizing President Trump after bearing witness to how candidate Trump targeted and harassed minorities would be a huge mistake. Politicians cannot be measured by their victory speeches. This was a not a normal election, and there is no evidence that Mr. Trump could ever be a normal politician. Not a single speech of his during the past campaign can lead us to expect anything other than the worse in the forthcoming months. Trying to normalize him is nothing more than an exercise in wishful thinking. 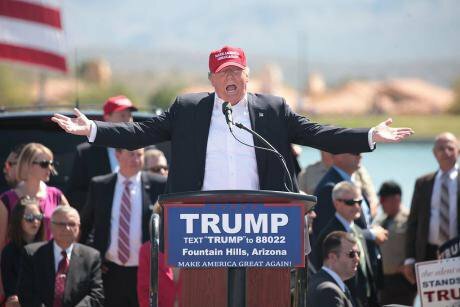 Mr. Trump won by tapping into America´s anxieties and underbelly drives. It would be hard to imagine him running the country in any other way. The conservative campaign against mainstream “liberal” media is not new – and it is one of the reasons why alt-right organizations like Breitbart have established themselves as a credible alternative for many. The Republican Party has been complaining for a long time about an existing media bias against conservative and rightwing views. But Mr. Trump adopted a different approach: he sought to undermine free press by linking it to the establishment. His claim that the election was rigged was in fact an attack on journalists for exposing Mr. Trump for what he really is, for objectively pointing out his many shortcomings and unsuitability for the post, and for reasoning that Mr. Trump as President would be a disgrace for American democracy and a major security risk for the world. Mr. Trump attacked them for exercising their responsibility to inform American citizens of the dangers ahead. Mr. Trump adopted a different approach: he sought to undermine free press by linking it to the establishment. By raising doubts about most issues, Mr. Trump placed truth and lies on the same level. Irrespective for legal provisions and democratic culture, he has done all he could to undermine the press by refusing to condemn his supporters’ attacks against media representatives, proposing to establish limits to the internet and press freedom, advocating the opening up of libel laws, and denying press credentials to several media outlets. He accused the media of campaigning for Clinton and colluding with her to rig the election. And his message was surprisingly successful: it drew voters and legitimacy further away from Clinton and the press. Emotion trumped the truth. Journalists should deal with President Trump better than they did with candidate Trump. First, explaining to citizens that this is not about taking sides, but about being aware of the dangers of entrusting so much power to someone who does not respect democratic principles. Second, holding him accountable for his incompetence, his conflicts of interest, his nepotism, his appointments. By asking the right questions and addressing the right issues the media can force Trump´s narrative to make room for accountability. Third, debunking his assertions with facts and data - an especially important task in a context where social media and, notably, Facebook had a significant role in deciding the outcome of the election, and many citizens appear to have trouble distinguishing between reality and fiction. This is something alt-right media outlets have understood all too well: readers approach the news in a different way than in the past, they look for amusing narratives, distinct story lines, drama and, inevitably, heroes and villains. Journalists should deal with President Trump better than they did with candidate Trump. Respect for facts is not an issue in post-truth times. This is where social movements disguised as media outlets like Breitbart come in, and why it is so crucially important to close the media´s legitimacy gap amongst conservatives - to explain to readers that despite all they have been told, Clinton and Trump are not two sides of the same coin, that democracy and political correctness are not empty words, and that there is nothing worse than a misinformed public. Journalists must focus on facts and remain vigilant. Stopping Mr. Trump from shattering the values that hold Americans together depends on convincing citizens that honest information, democratic principles and humanist values do matter. The concept of democracy is inseparable from freedom, the separation of power, a free press and minority rights. These are the pillars of our democratic systems. Mr. Trump’s unexpected victory should not distract us from the fact that the President-elect of the United States is an ignorant, narcissistic, and racist character who will crush democracy if he is given the chance. Against that, citizens have every right to protest. Those in the political ranks who try to portray civil resistance and peaceful protesting as unconstitutional are the ones who have never respected democracy and the US Constitution in the first place. Protesting the current situation is a right. And the exercise of this right is essential to protect democracy in the United States. Mr. Trump´s attacks on Latinos and women – both on and off camera – have told us enough about the agenda he intends to pursue. And his appointment of the likes of Reince Priebus, Steve Bannon, Mike Flynn and Jeff Sessions tells us enough about the methods he is willing to use. An America where the respect for others is brushed aside is not something most Americans would be willing to accept. Peacefully conceding defeat is an obligation, independently of our distaste for the result and the circumstances in which it has happened. But protesting the racist, prejudiced and hateful legislation that is likely to follow is not only a right, but a civic obligation. 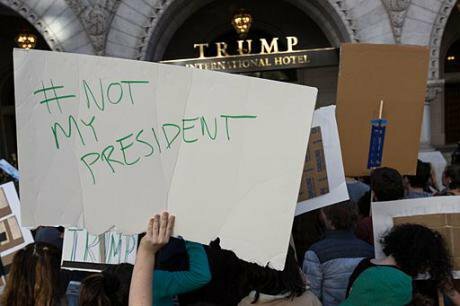 Protesters outside Trump Hotel on Pennsylvania Ave, DC. November 10, 2016. Lorie Shaull/Wikimedia Commons. All rights reserved. If there was ever a time for Latinos to exercise their right to vote, November, 8, was the one. Out of a population of 57 million Latinos legally living in the US, a projected 27.3 million were eligible to vote in this election – that is, 4 million more than in 2012. There is no denying that Latinos were enthusiastic about voting. But many were not motivated enough by Hillary Clinton´s message: her campaign clearly failed to wake up the sleeping giant. Only 65% Latino voters supported her, whereas 71% supported Obama in 2012. If you consider the increase in eligible Latino voters and Mr. Trump´s targeted attacks, this is certainly not the outcome which her campaign expected. Mr. Trump’s support among Latinos reached 29% - Mitt Romney got 27% in 2012 –, something that can be understood by recognizing that the narratives about Latinos voting as a bloc are misleading. Latinos did support Clinton over Trump. But the Republican candidate was able to find enough white voters to counterbalance her advantage. Mr. Trump was elected not because of Latinos, but despite them. During the campaign, Mr. Trump positioned himself as the defender of American identity. But he knows little about belonging. Millions of Latin Americans have family living in the United States. And they share a social and cultural bound. Questioning the Latinos’ place in the US would send shockwaves throughout the continent. It would have an unpredictable impact on the region. And the resulting tensions would go far beyond trade deals. Where these tensions stop depends on the willingness of American parties – both of them – to protect their citizens, and on the ability of Latin America to stand up once more against populism, authoritarianism and racism – abroad, this time. Mr. Trump was elected not because of Latinos, but despite them. Many Americans decided to vote for a candidate who stands for hate and divisiveness. They are free to do it. In the end, citizens are free to choose their leaders and to ignore reason and rationality. However, both political institutions and the law must remain vigilant – ignorance and hatred never produce anything good. And we should remember that history proves that autocrats do emerge from democratic systems. Why not in America? American institutions are solid, and the rule of law is strongly installed in American political culture. But institutions can be co-opted: just look at Russia or Turkey. Most Americans believe that tyranny is not possible in their country. But it would be a mistake to think that democracy comes naturally to us. It doesn’t. Democracy is a process that requires tolerance and empathy. Values are not inherited, they have to be taught and nurtured. Mr. Trump can teach us nothing about tolerance and empathy. Denouncing him for his disrespect for democratic principles is not part of an institutional campaign in favor of Democrats, the Liberals or the Establishment. It is part of a social campaign to prevent autocratic principles from being normalized and thus becoming as good as democratic ones. Democracy is a process that requires tolerance and empathy. Values are not inherited, they have to be taught and nurtured. Democracy requires equality, respect for the rule of law, for human rights, for due process and privacy, for freedom of expression. It requires a free press. It doesn’t need easy answers. It has never been so important to take time to reflect, to listen to each other, to learn and make sense of what is going on. And to show that, in a democracy, even all-powerful administrations can be held accountable by the people. We have done it before, we must do it again.